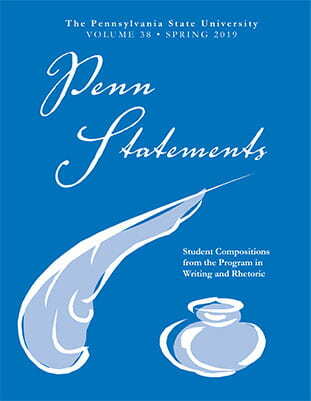 Every year, first-year writers are able to see their work published in Penn Statements, a collection of student writing used in every first-year writing course. Compiled and edited by the Program in Writing and Rhetoric, Penn Statements seeks to provide examples of how other students have responded to first year writing assignments that enliven classroom discussion, prompt reflective journaling, and enrich instructors’ assignment preparation. For the Penn Statements 2019 Multimedia Site, click the image on the right. We welcome all submissions. Are you particularly proud or excited about an essay you’ve written in ENGL 15 or 30? Feel free to submit your essay for consideration by using the link on the right and filling out the form. Only one essay per student can be accepted, so choose the one or two essays you feel are the strongest. If your essay is selected for publication, you will be notified usually during the Fall semester. Upon being selected, you’ll receive a copy of the magazine and have a publication to show friends, family, or future employers. If you receive a student essay that is particularly outstanding, or that you feel really addresses an assignment in a productive way, we urge you to ask that student to submit his/her essay (as per the instructions above). As with our advice for students, try to avoid submitting an entire semester’s worth of essays. Part of the success of Penn Statements depends on our instructors using and adapting Penn Statements to their classrooms and submitting essays that they feel will be useful in future semesters. All submissions will be reviewed, with final selections made during the Fall semester and the magazine being published annually in the Spring semester. Importantly, though, the magazine has rolling submissions, so any essay submitted after the final selection will automatically be considered for the next year. In other words, ask your students to submit strong papers at whatever point in a given semester or summer term they produce them, regardless of the deadline. We’re always looking for as many great essays as we can. Ex: Rhetorical Analysis, Multimedia Memoir, etc. I, ___, give Penn Statements permission to publish my essay, "___." Add your name and the name of your project to the form.